The contributions of one of the best known Italian Renaissance masters, Jacopo Tintoretto, to the art history are grand, especially because of the authentic and rather bold brushwork, which largely influenced later generations of artists. 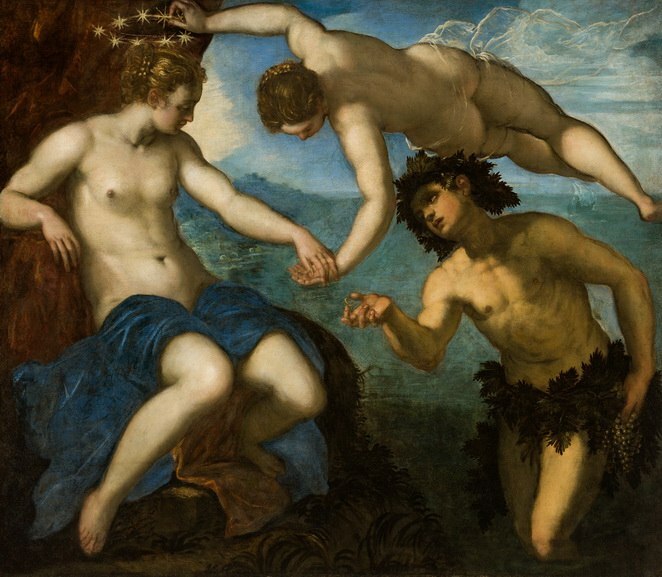 Namely, he expanded the domains of the Venetian school, and was even called Il Furioso for his outstanding energy and dramatic painterly features. The last year was marked by the 500th anniversary of the birth of the great painter, so the city of Venice along with other institutions organized numerous exhibitions and accompanying events. The National Gallery of Arts in Washington, DC recently opened three outstanding survey’s concerning Tintoretto’s impressive oeuvre as a painter and draftsman, and the broader social and cultural context of the era during which he was active. The first one is called Tintoretto: Artist of Renaissance Venice and it is co-organized with the Fondazione Musei Civici di Venezia and the Gallerie dell’Accademia. 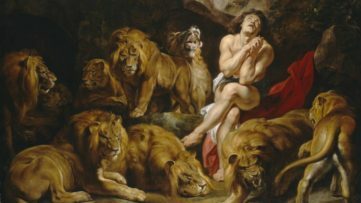 This is practically the first extensive retrospective of the artist in North America, and it encompasses around fifty paintings as well as works on paper spanning from portraits of Venetian aristocrats to religious and mythological scenes. The second exhibition is called Drawing in Tintoretto’s Venice and it reveals new interpretation of his artistic development, creative process, and workshop practice through the finest examples loaned from public and private collections. The third one titled Venetian Prints in the Time of Tintoretto and it features around thirty prints including etchings by Schiavone, engravings by Agostino Carracci, and extraordinary woodcuts by Giuseppe Scolari. Although he was somehow overshadowed by the more successful Venetian painters during his lifetime such as Titian and Veronese, Tintoretto was indeed one of the most prolific painters of the 16th century. 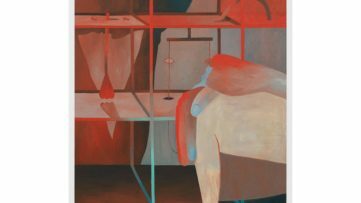 This exhibition tends to provide a complete insight into his work by gathering the best known, as well as rarely seen, artworks made throughout his career – a total of forty-six paintings and ten drawings. The large scale canvases such as Paradiso (modello) produced by the artist in 1538 are on display along with a selection of exquisite portraits mainly loaned from the Gallerie dell’Accademia and Palazzo Ducale. Four works which recently underwent thorough conservation are on display, including Saint Martial in Glory with Saint Peter and Saint Paul (1549, Church of San Marziale), installed in the Lobby B of the museums West Building. The curatorial team consisting of Robert Echols, independent scholar, Frederick Ilchman, chair of the Art of Europe department and Mrs. Russell W. Baker Curator of Paintings at the Museum of Fine Arts, Boston gave their best to present the full scale of Tintoretto’s painting. Interestingly so, this particular exhibition is the first in almost four decades to focus on Tintoretto’s draftsmanship. Titled simply Drawing in Tintoretto’s Venice, it is organized in seven segments which feature works by his contemporaries – older artists such as Veronese, Titian, and Bassano, as well as the younger ones such as Palma Giovane and the artist’s son Domenico Tintoretto, all inspired by the great master himself. Tintoretto’s preparatory drawings and a group of studies of sculptures by Michelangelo, especially Samson and the Philistines from 1550, as well as those in the Medici Chapel and others, are at the center of the exhibition and these works show the principles of teaching practice in his workshop. 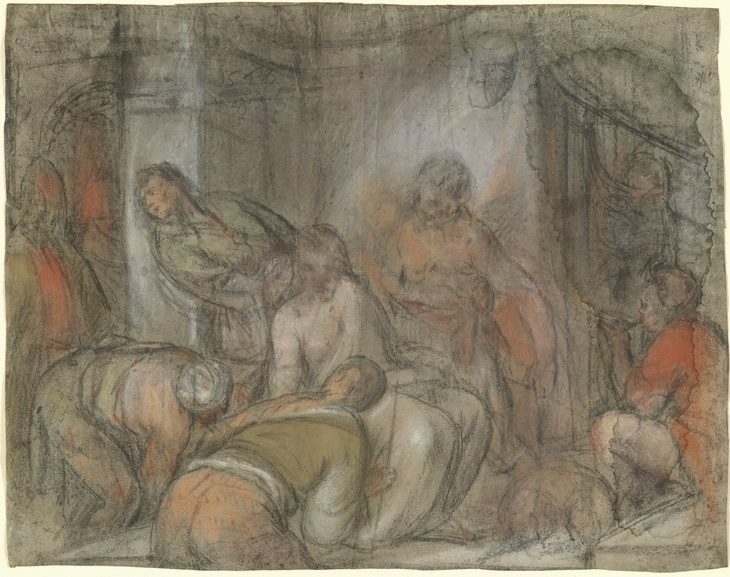 A group of exceptional drawings connected with Tintoretto and his followers, proposed by the scholars as the work of the young El Greco dating from his Venetian time will, concludes the show. John Marciari, the Charles W. Engelhard Curator and head of the department of drawings and prints at the Morgan Library & Museum curated the exhibition which is accompanied by an extensive illustrated catalog written by the curator himself offering precise analyzes of Tintoretto’s drawings. 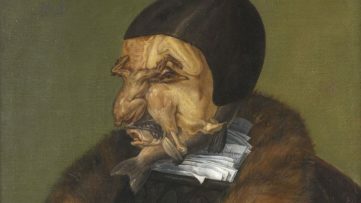 The last exhibition at the National Gallery of Art is called Venetian Prints in the Time of Tintoretto, and it tends to reveal the creative forces, developments and interconnections of the proponents of the Venetian scene during the 16th century. The show, curated by Jonathan Bober, Andrew W. Mellon Senior Curator of Prints and Drawings, National Gallery of Art, offers a nice overview of the printmaking activity in the given time-frame and it underlines smoothly how young Tintoretto was inspired by the Venetian print production, in particular by Schavione’s etchings. 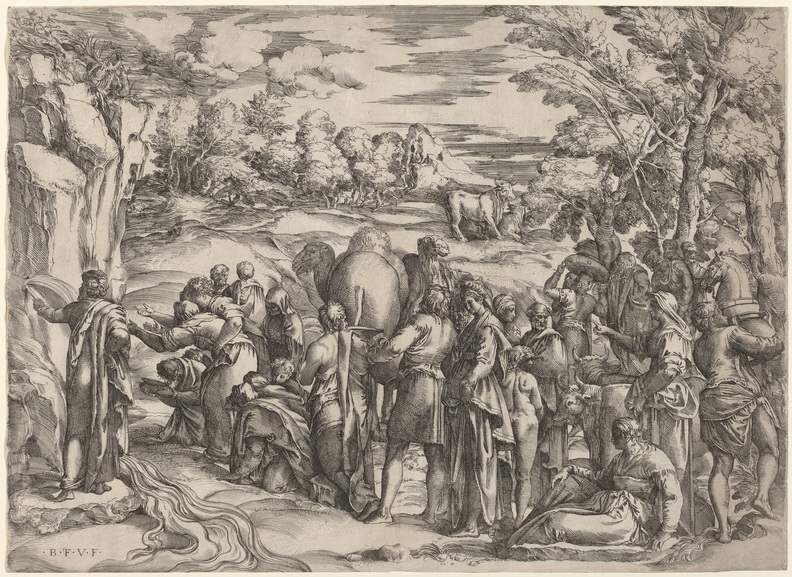 To be more precise, By combining traditional Venetian tendencies and mannerism, Tintoretto made a particular stylistic departure and proposed an aesthetic largely inspired by the print; the works of Battista Franco and Giulio Sanuto are on view as well in order to show this connection. After all stated above the impression it seems that these exhibitions offer a refreshed and more accurate understanding of Tintoretto’s oeuvre and chronology; they definitely give a much-desired deliberation of the motifs, inspiration, and all other layers of Tintoretto’s practice, as well as a proper socio-political context of the outstanding period in art history. Tintoretto: Artist of Renaissance Venice, Drawing in Tintoretto’s Venice, and Venetian Prints in the Time of Tintoretto will be on display at the National Gallery of Art in Washington DC until 9 June 2019. Drawing in Tintoretto’s Venice offers a complete overview of Tintoretto as a draftsman. It begins with a look at drawings by Tintoretto’s precedents and contemporaries, a discussion intended to illuminate Tintoretto’s sources as well as his originality, and also to explore the historiographical and critical questions that have framed all previous discussion of Tintoretto’s graphic work. Subsequent chapters explore Tintoretto’s evolution as a draftsman and the role that drawings played in his artistic practice—both preparatory drawings for his paintings and the many studies after sculptures by Michelangelo and others—thus examining the use of drawings within the studio as well as teaching practices in the workshop. Later chapters focus on the changes to Tintoretto’s style as he undertook ever larger commissions and accordingly began to manage a growing number of assistants, with special attention paid to Domenico Tintoretto, Palma Giovane, and other artists whose drawing style was influenced by their time working with the master. 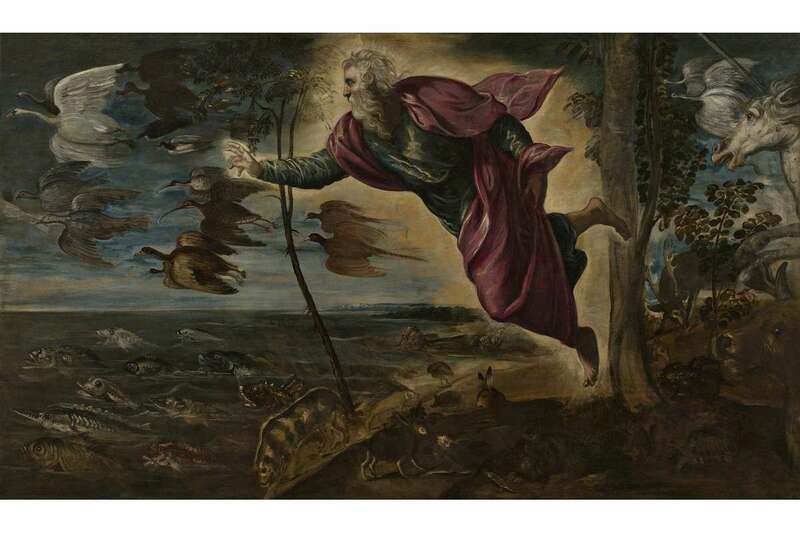 Featured images: Jacopo Tintoretto – The Creation of the Animals, 1550- by 1553. Oil on canvas, overall: 151 x 258 cm (59 1/2 x 101 5/8 in. ), framed: 162 x 270 cm (63 3/4 x 106 5/16 in.). Gallerie dell’Accademia, Venice; Jacopo Tintoretto – Summer, c. 1546/1548. Oil on canvas, overall: 106 x 193 cm (41 5/8 x 76 in. ), framed: 135.9 x 224.8 x 8.5 cm (53 1/2 x 88 1/2 x 3 3/8 in.). National Gallery of Art, Washington, Samuel H. Kress Collection. All images courtesy NGA.